Some periodic tables may show elements 113, 115, 117 and 118 with their temporary working names and chemical symbols. The official names and chemical symbols were agreed in 2016. Discover the origins of the Periodic Table. See what an atom would look like if it were much, much larger. Find out about some of the elements that make fireworks so fantastic. Where does gold come from, and is it possible to make gold? Find out more about carbon (see page 11 of your book), and the role of carbon in climate change. Lots of fascinating facts about metals. Try a quiz game and build an atom. Combine elements to create chemical reactions. What compounds can you make? Find out how to blow up a balloon with a chemical reaction. Test your knowledge of the Periodic Table with a flashcard quiz game. The scientists in these links were so important, they had elements named after them. Watch a video about the life of Marie Curie, who discovered the elements polonium and radium. The element Curium was named after her and her husband. The element nobelium was named after Alfred Nobel. Who was he, and what else is named after him? Find out more about Dmitri Mendeleev and how he developed the Periodic Table. The element Mendelevium was named after him. Einsteinium was named after Alfred Einstein. Find out more about the famous scientist in a short video. Copernicium was named after astronomer, Nicolaus Copernicus. Find out how he changed the way people see the world. Find out about Niels Bohr, whom the element Bohrium was named after. Everything in the Universe is made up of just 118 chemical elements, all of which are listed in the Periodic Table. 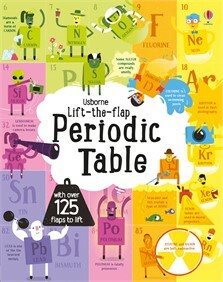 Lift the flaps in this informative book and discover which elements are crucial to life, which are smelly, explosive or radioactive and lots more. An essential introduction to the building blocks of chemistry, with over 125 flaps.